Watch out for 1,000s of FREE student wagamama katsu! Cash-strapped students, this one’s for you! If you need a break from the books (or boozing!) this month hit up wagamama which is giving away thousands of FREE katsus! It’s to coincide with National Katsu Curry Day on September 27th. To celebrate the pan-Asian food specialists will be dishing up 50 totally FREE meals at every one of their restaurants that day. So wherever you are, you’ll be near by; there’s 39 wagamama outlets in London alone! What do you need to do? Easy as – just show up early doors, flash a valid NUS card when you order and the tasty goods are all yours. Choices will include a high-protein chicken katsu coated in crispy breadcrumbs and smothered in an aromatic curry sauce. Or there’s a veggie option – the yasai katsu with piping hot sweet potato, aubergine and butternut squash comes sprinkled with panko breadcumbs and creamy topping. Both are served up with sticky rice on the side plus a salad too to make sure you’re getting one of your five a day! If you fancy spicing things up a level, you can even try the limited edition hot katsu. The devilish dish is doused in hot sauce and fiery chillis. As per the regular version, curious curry fans can choose from either chicken or yasai options. The red hot main was initially offered at Noodle Lab on Dean Street in Soho where new and creative wagamama dishes are trialled before being rolled out nationwide. You’ll have to be quick; the hot katsu is only available for a week leading up to the student giveaway. 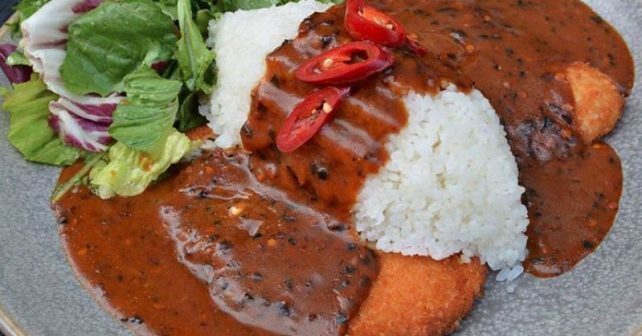 Steve Mangleshot, Executive Chef at wagamama says, “The katsu curry has remained untouched since 1992 so it’s a big moment for us to be trialling an extra spicy version.  Thursday 27th Sept: wagamama’s FREE student katsu giveaway.  Available at every wagamama in UK. First come, first served so check opening times. One per customer, eat in or takeaway.  There will be 50 free katsu dishes on offer at each restaurant. Must have a valid NUS card to qualify.  Usual price; chicken katsu – £10.75 / yasai katsu – £9.75.  The hot katsu curry is available nationwide from Thurs 20th – Thurs 27th Sept (hot chicken katsu – £10.75 / hot yasai katsu – £9.75).  Declare whether you’re a #katsuconvert or #katsuclassic on wagamama’s social media channels.  For more info about National Katsu Curry Day click here.  For your nearest wagamama and all other info click here.